Does Team Poker Have a Future? World Team Poker is the next “big event” in Las Vegas … gets underway at the Golden Nugget with a party tonight (of course) and cards in the air on Wednesday. The WTP will be the third big-dollar, made-for-TV attempt to bring team poker to Las Vegas (fourth if you include one that was canceled the weekend of) … and like all the rest, as the WTP teams came together, the usual on-camera stars lined up to get their airtime register. 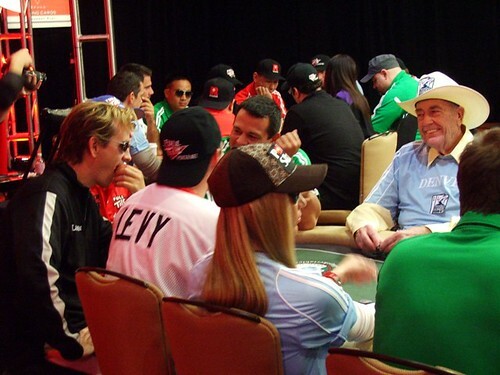 We can tell there is a definitive desire for team poker somewhere — why else would the pros keep showing up? — and everyone who ever plays in these events reports having an absolute blast. But for some reason or another, they often tend to falter. Will the WTP be a matter of someone finally getting it right, or is there something inherent to the game itself that makes team tournament poker a concept that just can’t stick? The WTP inaugural at the Golden Nugget will feature eight teams of what seem to be six, seven, or four players each. They face off at different tables, in shootout-fashion. We’ll be able to watch it low-res live and streaming here. Sounds great, no? I presume that list is in order of seeding. Team Greece is already being made out to be the potential Cinderella story. The PokerBowl grew out of a local team concept that had taken off in a couple cities — creating an event where teammates were identified by wristband, and chip-dumping, collusion, and hand signals were all part of the game. So they took it to Vegas, promised a million-dollar prize pool, and before you knew it, TV production crews were on the clock, and all the top pros and recent stars (Steve Dannenmann, for example) on board … 25 teams of six, split up into five “conferences”. Day 1 was a drinky day for Scotty Nguyen, which 9 times out of 10 great for TV. The whole city concept got lost along the way … but that didn’t really matter nearly as much as the issue of collusion. Many of the online-backed pros — if I recall, Doyle Brunson (playing for Denver) had the final say –refused to play if endorsed collusion was gonna be part of it. So USPB ganked it … no cheating allowed … and all the semi-pros and TV-unknowns who paid their $6,600 buy-in had to unlearn signals, for example, like covering your cards with two chips to signify a pair, and placing them like clock hands to indicate its strength. But for all the clusterfuckiness that goes along with the first attempt at any new-big event, everyone seemed to be having a blast … so much laughter, screaming, hugging, and general raucousness amongst teammates. There we’re only two people in the entire Key West Room at the Palms who looked unhappy — John Nightingale, the creator of it all, and John-Robert Bellande. Bellande’s team had cashed, and the fresh-from-Survivor big-man was becoming a bit irate that a check for his winnings would be sent to him by mail … in a few weeks. That scene was not the new era of poker they wanted to show on TV. I first sensed that something was wrong when Tom Schneider and I got hired as the television hosts … without having to send in a video or even talk to anyone on the phone! By the time they mysteriously fired Lacey Jones on Day 2, only to replace her with Nightingale’s wife … Tom and I began discussing bets on whether or not the show would ever make it to TV. It never did. Clearly the event had grown beyond the infrastructure needed to support it. And Nightingale made the critical mistake of forgetting that just because several pros lured in on a freeroll, someone still needed to cover their buy-ins in the prize pool! It would take months before the winners received their checks, which all bounced … more than $440,000. The Palms would eventually end up making good on the payouts, but still received an additional $100,000 fine from the Nevada Gaming Commission. Similar concept, smaller teams, and a patented scoring system that ensured teammates would never be at the same table until the final. But once in the big-money, teams could call time-outs to collaborate on a hand. There were two separate prize pools — for team and individual results. The folks running this one seemed to be good people … and sure enough, at their inaugural event at the Hard Rock, DTP paid their winners, lol. (Who woulda thunk that in tself would be enough to have everyone happy-happy.) From there they threw a second event … this one even bigger, 144 teams on about a $500 collective buy-in, at Caesars. Again, a great party beforehand, and a fun tournament to follow. DTP seemed well on its way … hooking up a $1,680 (per team of three) non-bracelet event at the WSOP. They even got to do a dry run at the media event, and then at the real deal, where 366 players bought in (122 teams) … none other than Team Tao of Pokerati took down the team prize … (for what would become the biggest score of my not-so-pro poker career). Alas, though Team Tao of Pokerati are still the defending WSOP Team Champion, it seems that instead of becoming the team poker ambassador I envisioned, we’ve been relegated to just a footnote in the poker almanac under one-off events. The problem Dream Team ran into, apparently, was that running a solid operation (that pays winners promptly) costs money! So even though copycat events began springing up — using slightly altered rules to dodge patent issues — instead of growing bigger, Dream Team Poker’s next step looked like downsizing. They launched a small buy-in team league at the Bike, which was supposed to be a beta-test of the concept they were hoping to bring to casinos around the country. Like everything else team poker, that seemed to develop a loyal following of players. But as of now their status seems up in the air. There’s no word of Dream Team continuing for a second season at the Bike, and they’re no longer listed on the Bike website. We’ve heard nothing publicly from Dream Team since their 2009 season finale. Supposedly they still exist … but it seems they are laying low, perhaps looking to retool their business model. Even so, they were the one team concept that was an arguable success … yet at present their future is unclear. After the successful DTP event at WSOP we had many requests for DTP to come to local casinos. With that in mind, we successfully beta launched of our league product for local casinos at the prestigious Bicycle Casino. With the game becoming so widely accepted, we have been working on several very large partnerships to take DTP worldwide across other platforms. These partnerships do take time to formalize and we believe itâ€™s very important to pick the right partner when dealing with contracts that secure long term rights in events, online, and TV. We know that our patience will be rewarded. I couldn’t even tell you the rules of this Ryder Cup-like set-up designed especially for WSOP-Europe … a made-for-TV special event put on and put together by the WSOP-E with their lead sponsor Betfair. But Betfair is no longer with WSOP-E … their contract ended after ’09 and they didn’t renew … which is fine by World Series officials, who look forward to self-sponsoring the London event with WSOP.com, CaesarsCasino.com, and CaesarsBingo.com. With those kind of web-names to be pimping, you’d think a 2nd annual Caesar’s Cup would be inevitable. But there’s been no mention of it, and word last fall was that a repeat performance wasn’t likely. Again, at best unclear … but another team event — this one more contrived than others — that still hasn’t taken solid hold. From the best we can tell, the inaugural Battle of Nations (presented by some Asian site I had never heard of called JBet) was a success — sounded pretty exciting with the Koreans (Steve Sung, Chino Rheem, and Brandon Wong) beating the Vietnamese (represented by the Le brothers, Nam, Tommy, and Allen) … it was the battle of America’s Asian war enemies from the second half of the 20th century, fighting it out amongst themselves for honor and Hong Kong dollars on the APT in Macau. Do not, however, confuse the APT (Asian Poker Tour) with the APPT (Asia-Pacific Poker Tour presented by PokerStars) There’s been just one running of one event so far, sponsored by an online site that wasn’t sponsoring the whole tour, and may or may not matter in the Eastern Hemisphere. Remains to be seen if there will be a round 2 of world poker fighting (hey, quick, somebody trademark that!) in Macau. 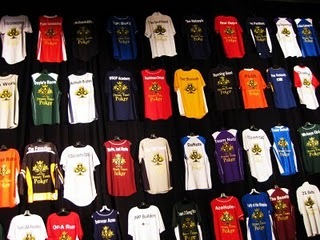 With plans to turn the International Team Poker League into the greatest televised reality poker show in 2010, the ITP League is kicking off the year with an event in Vegas which promises not only to have a great poker tournament line up with fantastic prizes but also an experience of a lifetime. Their opening non-team charity event went fine … but they knew they might have problems come the open main event — which was supposed to be the springboard for the whole league. Not only was no one buying in directly (at $3,500/player), but they couldn’t even make a table for a $350 satellite. So that’s pretty much a complete history of team poker as we know it in the 21st century. The latest incarnation of a collaborative (but non-cheating) game — the WTP — gets underway Wednesday at noon. We can only anticipate there will be jerseys. I’m by no means assuring failure. Think how many would-be pioneers took off with wooden arm wings, hopping carts, and soda-water jetpacks only to literally fall on their faces before the Wright Brothers came along and finally figured something out. Once that happened, a true revolution was underway, and in less than a lifetime humans were hopping around on the friggin’ moon! I can almost guarantee you the WTP will be a hopping wild, great-fun televisable event … one that has people talking about how awesome team poker is and speculating on how it seems an inevitable part of poker’s future. But what no one seems to be able to guarantee — no matter how things go this week — is that any of these events can survive long enough to become more than just a really good time, a business venture that didn’t quite take hold, and a footnote in the history of poker. I thought the WTP would be five tables with eight players at each table. The Doubles Poker Championship (coming July to GSN) is a spin-off of the Caesars Cup. A forgotten team concept is the PPL, which held its draft at the Venetian around the time the UIGEA got passed. Regarding the WPT, it took them nearly a year after their announcement to get this thing going. It’s being run by the same people who were behind Live at the Bike, which is scheduled to make a return later this year. what, pray tell, was the PPL. Pro Poker League? and lol on the doubles poker … you can see in the secret pokerati workshop i actually started a post about that a week ago when I saw everyone tweeting about it, but had already forgotten. Professional Poker League, there was talk they’d be airing their league “matches” several times a week on PAX. I don’t think I’ve read that secret one yet, although maybe Andrew Feldman was when he was mentioning on his Poker Edge podcast on ESPN.com about the NAPT not returning to Vegas anytime soon. Super-interesting on the PPL. I just read the Phil Gordon article from 2006 … had totally forgotten about that one. So 2006, another one that went nowhere (sure, the UIGEA may have been a valid excuse) … even with Matt Savage running it. I’m not so sure doubles counts the same way. Seems like a bit of a different animal … and I believe they’ve had successful doubles events over the decades. Will have to see how it plays out when the Doubles Poker Championship airs on GSN. Listening to Phil Gordon explain the DPC now … definitely not the same as team poker. Sounds more gimmicky … or game-showy with a $50k buy-in. Could be wrong, but I’ll stick to the notion that it’s at best a distant cousin to the team poker we are talking about here. I’d agree with that assessment Dan. For the record, the rocket technology used to reach the moon was not a direct descendant of the Wright Brothers’ Flyer. It was theoretically possible to put a man on the moon before the invention of the airplane, because rocketry has little to do with aerodynamics. Jules Verne wrote a great novel where Civil War-era Americans sent men to the moon using ballistics — cannon technology. I’ll be loosely following the opening event of World Team Poker to see if they’ve found the secret ingredient, but I’m skeptical. I’d love to be proven wrong here. Can the WPT “get it rght”….LOL When in the last 3 years has the WPT gotten anythng right? @JW: This post isn’t about the World Poker Tour (WPT), but World Team Poker (WTP). The two have nothing to do with each other. I for one sure hope so … I don’t even need the Team Poker ambassadorship, I’d be happy with just two footnotes in the annals of poker evolution. I played in the last two Dream Teams… the Ceasars one was much more fun. But it was $500 + vig a man, not $500 total. For me, it’s a good once a year fun activity to wind down the WSOP, but not much more. And I feel that way about any team event. So Caesar’s was a $1500 +vig team buy-in, too? I thought it was smaller, but obv. I could be wrong. I’m biased you know, having dug team poker since the PokerBowl, and seeing one that seemed to work with Dream Team. But I could definitely see myself playing a small buy-in team event like once a month, or every-other month … while working toward a big one in the summer. Not sure if that’s a profitable biz model though .. and I certainly see satellites being a struggle. Another team poker event I forgot about is PokerStars World Cup of Poker, and America’s Cup where members of a team play with the same stack. Considering that the first WTP is still going on, the chances of #2 taking place are slim. P.S. I saw that PokerStars World Cup and America’s Cup when I was originally researching this post. However, I decided not to include them because I felt even though they still existed (I think), their connections with a single online site made them different from these sorts of live events. And it’s not like any of them have exactly caught on. Changing players between streets, a la the Caesar’s Cup, is a bad idea, imho. I guess they’re going for a golf scramble kinda thing, but meh … doesn’t seem to work. Maybe the finished product will be incredible, but I’m thinking F-Train will have an amazing blog post about the taping. The PokerStars World Cup takes place during the PCA (I made a post about the German slowrolling Darus Suharto) and the America’s Cup takes place in June during the next LAPT stop in Peru. I’m guessing this is a good warm-up for the WSOP for you kevmath? You know, staying up late to watch an event, then going to sleep, and then waking up to find it still going? That’s one way to put it, although I’ll surely have a real interest in the WSOP event, no matter who’s remaining. you ever gonna make it out to the series in person? kinda shocked, btw, to see johnny chan still wearing All In Energy. thought that product was done. it’s not in my LV Albertson’s anymore. I was surprised by Chan bringing that out too, guess he’s really upset that Red Bull’s taken his spot. Anyways, congrats to Team China for winning. What makes makes Dream Team so much better than WTP is regular players who enjoy the game, like myself were able to play. Plus the announcing of this event was HORRENDOUS even for free on the internet.